I am sure you all received an email from United stating that Premier/Elite benefits will be extended into the first quarter of 2012. However it not state the exact date. The good news is your United status will not expire on January 31 unlike other carriers which carries your previous year’s status to the end of February (see my previous post). The real news United did not highlight is the fact that United will be adopting the Continental OnePass system as I have predicted last summer (see previous post). This means United flyers will need to use their OnePass number to bank miles starting in March 2012 (see United link). For those United flyers without a OnePass number, I’m sure United will be sending you a new six digit account number soon. More importantly, United will be adjusting all the actual airline miles you have earned from partner airlines and count them towards your MileagePlus Million Miler program. To get this information, login to United MileagePlus Personalized Preview via this link. As you can see below, all of my miles earned from partner airlines and Continental have been added to my lifetime miles on my MileagePlus account. As indicated by United, MileagePlus and Continental’s OnePass program used to track lifetime activities differently. United MileagePlus counted only base EQM (actual flight miles on United and United Express), while OnePass counted both base EQM and additional EQM (those earned on partner airlines or through promotions or certain credit cards). United was kind enough to recalculate its MileagePlus lifetime miles balances to include additional EQM earned since enrolling in the program. United will refresh the balance before the 2012 MileagePlus program begins on March 3, 2012. 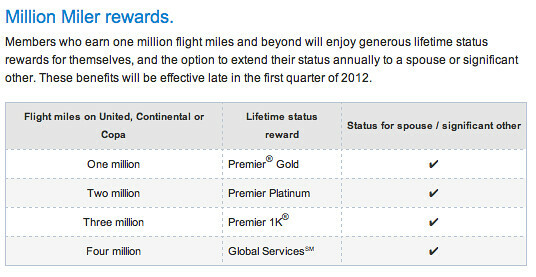 For those of you who are curious, below are the perks of becoming a United Million Miler.